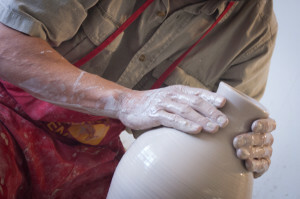 Dona Ana Community College (DACC) will hold an open house to showcase a new ceramics studio. The Open House will be held from 3:30-5:30 on Friday, December 2 at the Workforce Center at 2345 East Nevada Street, Las Cruces, NM. The lab features three electric kilns, a raku kiln, and a natural-gas shuttle kiln. The three different types of kilns enable students to explore firing techniques and atmospheres. The studio also has nine electric and two electric/kick potters wheels which are used to form clay into symmetrical shapes such as cups, bowls and vases. The studio features a slab roller, clay extruder, student storage and new work tables. A well-equipped glaze room for formulating and preparing ceramic slips and glazes helps students finish their work. Rounding out the lab equipment are a clay mixer and pug mill. DACC ceramics classes include ART 275 and ART 276, complimentary courses that introduce the techniques of hand-building, wheel throwing and glazing. High-fire and low-fire clays are used. The classes will be offered days, evenings and on Saturday during the spring 2017 semester. Schwaiger, recently returned from Jingdezhen, China where he observed and was inspired by artists whose lineage in porcelain production dates back to the Song Dynasty (960-1269). Schwaiger believes that his three-month study of Chinese art history, culture, and ceramics will enhance his ability to teach students about ceramic arts. “We invite the community to come and see our new studio,” Schwaiger said.